Saina Nehwal ranks third among the top singles badminton players in the world and is the only Indian to have reached the singles quarter finals at the Olympics, and won the World Junior Badminton Championships in 2008. 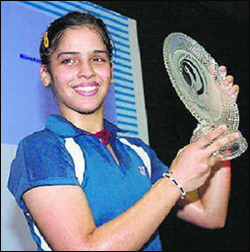 20 year old Saina Nehwal’s three titles in three weeks is a phenomenal achievement for the Indian sport. Saina was born in Hisar, Haryana,India and spent her complete life in city of Hyderabad. Her foray into the world of badminton was influenced by her father Dr. Harvir Singh, a scientist at the Directorate of Oilseeds Research, Hyderabad and her mother Usha Nehwal, both of whom were former badminton champions in Haryana. What does it take to make a badminton star like Saina Nehwal? Ask her father Harvir Singh. If Saina battles it out on the badminton court against the world’s best players, it has been no less a battle for her father to let her do the same. Rarely a middle-class family can think of spending half of the monthly income on an eight-year-old child’s training without knowing if the gamble would pay off. But Harvir Singh, a Scientist with the Directorate of Oilseeds Research Hyderabad, opted to go by the advice of PSS Nani Prasad Rao, the then badminton coach of the Sports Authority of Andhra Pradesh (SAAP), who saw immense potential in the girl. “I met Nani Prasad Rao in December, 1998, at Lal Bahadur Stadium in Hyderabad. Saina was standing with a badminton racket on the court and he asked her to play. After watching her game, he said,‘She has the potential and if you want to train her, bring her to me as a summer trainee,” Harvir said. The tough journey had started. Saina had to be taken to the stadium every day early in the morning and the distance from the house was 20 km. “It was a challenge for both of us because I had to wake up early so that we could reach the stadium by 6 am. The training session used to last for about two hours. After attending the training session, Saina had to attend school. This way I had to drive my scooter around 50 km daily as Saina, apart from attending rigorous practice sessions, had to concentrate on studies,” her father explained. The impact of this tough routine began to show in the first week as Saina would often fall asleep on the back seat. Sensing the danger, Saina’s mother started accompanying them on the two-wheeler. This continued for three months. Ultimately, the family had to arrange a house near the stadium in 1999. This time the distance was about 7 km from the stadium. But the travelling ordeal did not end here as Saina was asked to attend evening training sessions as well. “With an extra training session, the travelling expenditure rose to Rs 150 per day. Added to this was the cost of training. Shuttles, racket, shoes, guttings and what not had to be purchased regularly. I spent around Rs 12,000 every month to keep her going those days,” Harvir said. But how did the family manage such high-cost training? Saina’s father revealed that he had to sacrifice his savings. “I started withdrawing money from my provident fund. Sometimes it was Rs 30,000 and other times it was nearly Rs 1 lakh. It happened more than five times when I had to shell out money from my PF savings due to Saina’s various requirements,” said Harvir. He stated that the tight-rope walk continued till 2002 until Yonex Sunrise sports offered to sponsor Saina’s kit. “It came as a big relief. Fortunately, she got BPCL support late in 2004. Ultimately, she was spotted by Mittal Sports Trust in December, 2005. “But I had never disclosed to Saina my financial difficulties fearing that she might get disturbed knowing that her father was left with no savings for the future,” he said. When asked if they got any help from the sports authorities, the answer said it all. “Till 2003, she was getting Rs 600 per month from the Sports Authority of India (SAI). It was raised to Rs 2,500 in June, 2003. You can understand how I could have managed,” Harvir said. Apart from the training cost, hefty telephone bills put extra financial burden on the family when Saina started touring foreign countries for events. The byte-crazy media played a part too. Wherever she went, be it the Philippines or South Korea, her phone kept ringing. “A major part of the prize money that Saina got from big competitions like the Philippines Open and World Junior Championship was utilised in paying her mobile bills, which were between Rs 40,000 and Rs 50,000 in the touring months,” he said. But was the prize money enough when she began her career? “Saina was given just Rs 300 as prize money after winning the under-10 state level competition, held in Tirupati in 1999. The period between 1999-2004 was very trying for the family as we did not get any sponsor for her,” Harvir said. It was not only the financial burden but the risk of lagging behind on the educational front which added to the pressure. Saina had to skip examinations twice. She did not take her first year intermediate exams because of the Melbourne Commonwealth Games and later in May, she could not write supplementary exams as she was in the Philippines. At present she is studying in the second year at Saint Ann’s College, Mehdipatnam Hyderabad. Ironically, the family, despite her big success at the international level, has not been able to celebrate much. “She has never been to any party, any restaurant or cinema in the past seven years. When the electronic media personnel visited my home in May last year for shooting of a programme, I could not even offer them sweets. Do I need to explain why,” he said. The key to Saina’s Success is simple. Know and set your goal. Stick to one goal – if you chase two rabbits, both will escape. Knowing the goal clearly is crucial. People with a goal succeed because they know where they are going.. This entry was posted in Uncategorized and tagged all time badminton greats, badminton, badminton players, Beijing Olympics, Dr. Harvir Singh, Gopichand, great badminton player in india, great badminton player in world, how saina nehwal achieved success, indian success in badminton, Indonesian Open badminton, olympic gold medal for saina, Olympics, Prakash Padukone, S Nehwal, Saina, Saina Nehwal, saina nehwal is world no.3, Saina Nehwal success, Saina Nehwal's achievements, Saina Nehwal's great success, Saina Nehwal's hard work, success story of saina nehwal, top rankings of Badminton, women badminton player, women badminton player in india, women in badminton. Bookmark the permalink. Work hard like Saina, concentrate on your game instead of ads and affairs and you are rewarded with victory. Get distracted like Sania, concentrate on ads and glamour and you go down in your rankings. To me, it is not the success story of Ms.Saina.It is the success story of the parents of Ms.Saina. Thanks for posting this inspiring success story. Congratulations to saina for her sucess at international level of badminton.She is truely an insperation for youth.It seems that her and her parent’s struggle for nurturing a world class sportsperson is really paying off. Saina made india proud by her achievements .I wish her luck for the upcoming competions.I have faith that she will soon become the top ranked player and continue her consistency. Congratulations to saina for her sucess at international level of badminton.She is truely an insperation for youth as well as old.It seems that her and her parent’s struggle for nurturing a world class sportsperson is really paying off. ICAR felicitated Saina with a memento and called her a global celebrity and star belonging to ICAR family. Saina is a source of inspiration for 120 crore Indian people. Wishing her all success in her future endeavors, Dr. Ayyappan urged her to become brand ambassador of ICAR she is from our family member of ICAR. I wish her luck for the upcoming competions.Pray to God to keep her healthy, struggle free , stress free with her family. Congrats Saina.Your success story makes me to be inspired.My salutations to your parents.Best luck for your future. I would like to see you as a world celebrity! That should be your next goal, don’t get complacent with your success, the journey has just begun! May I congratulate you not only on your success but also because you are a live inspiration for many children with ambitions. I am Cardiovascular surgeon performing free cardiac surgery for less affluent kids as a project ‘Needy Little Hearts’ under K J Research Foundation, Chennai, India. May I request you to be Ambassador for’ Needy Little Hearts’? These children have ambitions and now that surgeries have been performed, have desires to achieve much. If you can meet them one day and just be with them, it will be a great day for them. May I, on behalf of these children, request your consent? Saina Nehwal is one of the best sportsperson in India today! What makes her tick?